Though Google has been helping iOS users transition over to Android for a while now, Apple is finally helping users do the exact opposite with the release of its first Android app, Move to iOS. The app, which appeared on the Google Play store this morning, enables users to seamlessly and easily move their important accounts and data over to the iOS ecosystem, including contacts, messages, bookmarks, mail accounts, calendars, and even photos and videos. 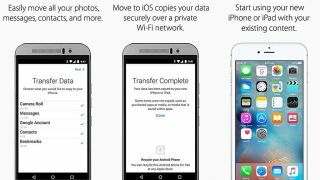 Move to iOS works by securely transferring your stuff over a Wi-Fi network created by your new iPhone or iPad, so there's no need to perform any kind of backup. Cheekily, once your transfer has been completed the app suggests that you recycle your old Android device "for free" at a nearby Apple Store. Apple has recently revealed that it also intends to bring its new Apple Music streaming service over to Android later this year. Move to iOS is a free download, and the only thing an Android user needs to have in order for it to work is a device running Android 4.0 or above.